Sakutarō Hagiwara, 萩原朔太郎(1 November 1886 – 11 May 1942) was a Japanese writer and poet, who was active in the Taishō and early Shōwa periods of Japan. Hagiwara’s first poetry collection Howling at the Moon had a widespread and immediate impact on the Japanese literary community and established him as the father of modern colloquial poetry in Japan. 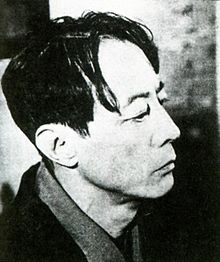 Hagiwara was one of the first poets to break away from the traditional, strictly metered forms of Japanese poetry, i.e. the formal, long standing 5-7-5 syllabic verse that dates back to the earliest period of Japanese literature (see for example Tanka and Haiku). His free-verse poems, written in colloquial Japanese language, established a new aesthetic in Japanese poetry, because he succeeded in attaining a sustained poetic lyricism (Gromles, 2003). He successfully “introduced colloquial idiom without sacrificing artistic merit” (Hayes, 1996, p. i) and elevated common Japanese speech to a poetic form. Hagiwara was deeply influenced by European nihilistic philosophy (Nietzsche) and his poems, pervaded with melancholy and nostalgia, express the existential despair of the intellectuals of his age. Besides giving moving accounts of the joy and sadness he himself experienced in his life, his poems often center on existential anxiety and emphasize his ability to delve into the alienated psyche of the ‘modern’ man. His use of traditional Japanese imagery –bamboo, moon, cherry blossoms, chrysanthemums- aimed at subverting these images of beauty, by revealing their decaying, ominous and musty quality. “He found loneliness in the dark roots of the bamboo grove; he felt the odor of cherry blossoms to be musty, as if they too were a source of melancholy; withered chrysanthemums became images of decay and sadness (Gromles, 2003)”. Hayes, C. (1996). A Stray Dog Howling at The moon: A Literary Biography of Hagiwara Sakutaro (1886-1942). Doctoral dissertation.